Indian Railways is now all set to introduce WiFi across trains. Indian Railways has approved the extension of Operation Swarn to premium trains such as Rajdhani, Shatabdi Express and Duronto Express. Delhi-Kathgodam Express was powered with WiFi hotspots, and proved to be very successful. Once WiFi is enabled inside trains, passengers will be able to access pre-loaded content via their smartphones/tablets/laptops and make their journey entertaining. As per a Railway Official, tenders will be soon floated. 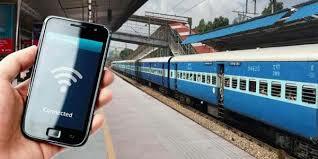 Reports suggests that Railways will install WiFi hotspots inside the trains, and passengers can directly connect with them. Once connected, the passenger will be able to access pre-loaded content such as music, movies, games and more. Now, we exactly don’t know who will decide which content will be put up, but based on available information, it is clear that the respective Zonal Railways will have a say in that. A hybrid model is expected to be implemented, wherein the Railways is able to generate some revenues from the passenger, and from advertisements which are shown within the pre-loaded content. Railways’ commercial department is right now working on a model which is feasible for both the Railways and passengers. Indian Railways had launched the ultra-luxurious Tejas Express, which was empowered with LCD Screens, headphones etc. However, within weeks, it was found that passengers have stolen LCD screens, and headphones, this proved to be a major embarrassment for the Railways. Hence, this time, the idea is to offer pre-loaded content via a portal, which can be only accessed via WiFi hubspots connected inside the trains. This way, there will be no danger of stolen LCD Screens and headphones, and the content can be also accessed.